Driving well over 2,000 kilometers per island in our rented Hugo campervan, we saw our fair share of wild life in New Zealand whilst cruising up and down the mountainous terrain. We weren’t limited to land or air creatures either; witnessing Fur Seal colonies, Hector’s Dolphins, Yellow Eyed Penguins and numerous feet inquisitive see-through fish. Yes, that is their official name. 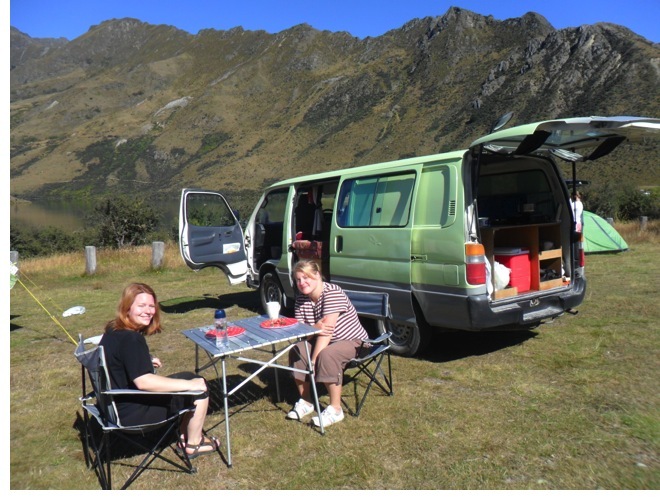 Us and our Hugo camper van in Queens Town, NZ. Driving them sort of distances was bound to up the stakes in our input to road-kill but I’m pretty sure all sparrows in New Zealand are suicidal! I admit to inadvertently aiding to the death of two birds during our travels, along with countless butterflies that decided they could not live on in this cruel world. 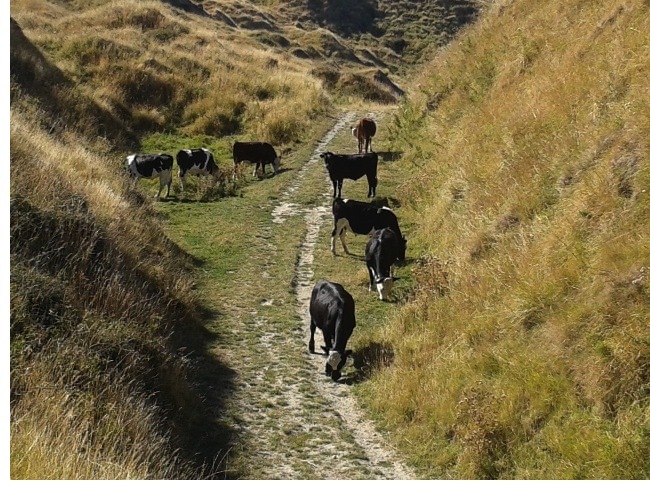 However, it wasn’t depressed death-seeking animals we passed on our walk to a beach by Mohaka River in Hawkes Bay; it was a herd of murderous (wo)MAN EATING COWS…. DOC Glenfalls campsite next to the Mohaka River. 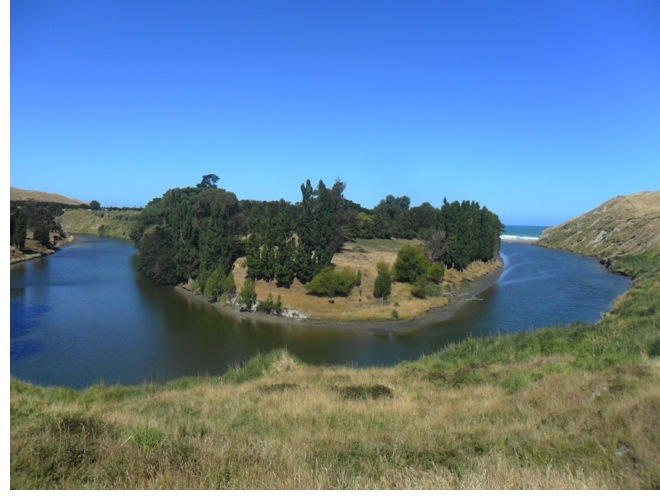 After an hours drive from the art deco capital of Napier to Glenfalls campsite, near Te Haroto, we decided we would take one of the designated DOC (department of conservation) walks to the nearby beach. The campsite was beautiful, the sun was shinning and the striking white sand felt like it was within a hands reach. The only thing in our way was this humungous mammal, guarding the only entrance on to the beach! Andrea: “Oh My God, Lucy – there’s a bull! Andrea: “But it doesn’t have udders! Lucy, oh my god Lucy, It’s standing up! Let’s RUN”. I thought best to follow Andrea’s haste and retreat to a safer distance whilst hurriedly discussing the likelihood of a bull being in a field in NZ. “But Lucy, it didn’t have udders! Do male Cows have udders! ?” We took refuge at the corner and checked out the massive mammal again, weighing our options. I had a staring match with the gate-guarding Cow (In hindsight, the worst thing to do) & after a nervous 10 minutes we decided to cut our losses and head back to camp. 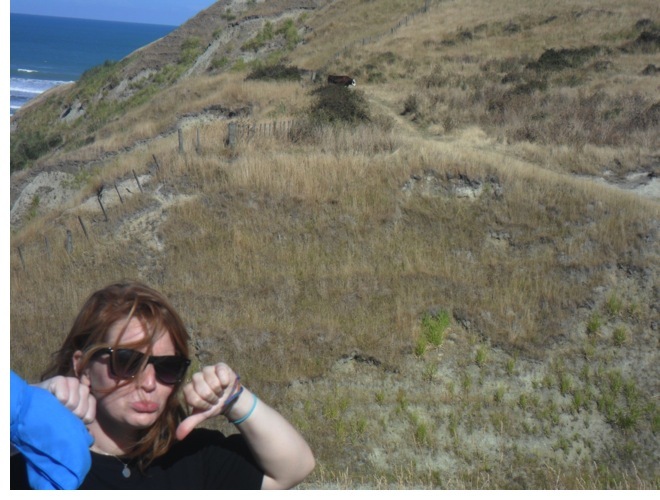 Andrea, admitting defeat on route to the beach. On route back to the campsite through the hills, we joked about the encounter and the possibility of running back in to the herd we passed on the walk towards the beach. Yup, you’ve guessed it! Walking slightly ahead of Andrea, I passed a corner and there stood a big strong fold of 9 more cows! A hilarious game of Human V’s Cow chess began. Well we were playing, but the herd maintained their ground on the only clearly defined path back to camp. 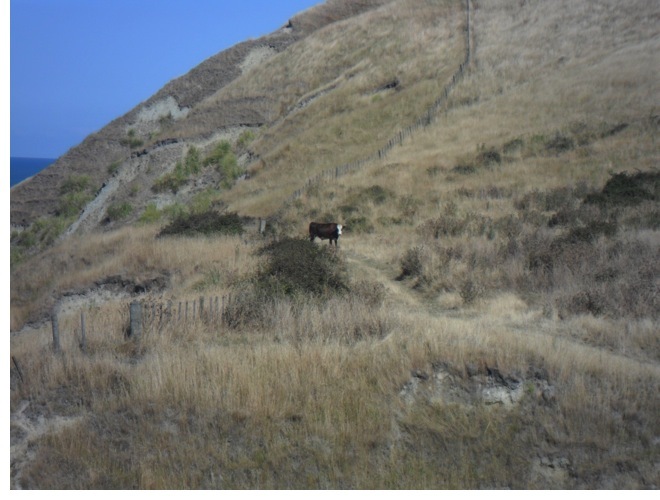 After 10 minutes of waiting, and the cows not moving, we attempted to climb the hill and go around. The herd broke in to two and surrounded us. We waited for the onslaught but after an ominous 5 minutes, the other half of the cows had disappeared. We climbed around the main herd on the walkway and jumped back on to the path a few meters away from the stubborn beasts. We eventually made it back to camp unscathed and had pasta for dinner… Alas, we didn’t have burgers to cook. Disclaimer: No cows or humans were hurt during this encounter. See? I told you all, but you just laughed. Cows are SO dangerous. I feel your fear girls. Beware! Haha. I don’t know why I ever doubted you Karrr. They were honestly the biggest / moodiest cows I have ever seen! Enjoyed the tale, what a pair of townies you are. Haha. I’m glad you enjoyed the story – I think even Chris would have been scared of the size of these cows mum!